These New Design Silver bars contain 10 full oz of .999 fine Silver and are made entirely in America using COMEX registered Silver refined at Republic Metals Corp. headquartered in Miami. Republic Metals Corporations (RMC) was established in 1980 and has since grown to become one of the largest and most respected Precious Metals refiners in the world. Throughout its illustrious history RMC has displayed excellence by becoming the first Precious Metals refiner in the United States to obtain ISO 14001:2015 Certification. The ISO 14001 is an internationally accepted standard that demonstrates a commitment to managing environmental impact of an organization. This program outlines how to effectively increase environmental performance and cut waste without comprising quality. 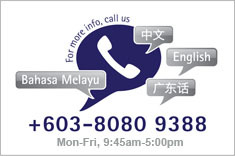 RMC currently holds listings on the London Bullion Market Association (LBMA), Commodity Exchange (COMEX) , Shanghai Gold Exchange (SGE), and Singapore Bullion Market Association (SBMA). As and LBMA-designated "Responsible Gold Party," all business conducted by RMC is performed in accordance with its stringent Patriot Act compliance and supply chain policies. They are also recognized and responsible for business practices from the Responsible Jewellery Council, Conflict Free Smelter Initiative, and the Ethical Alliance. 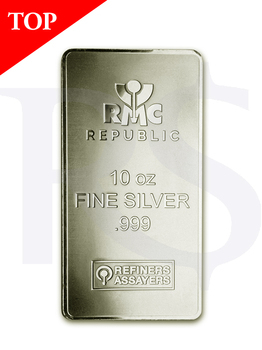 Contains 10 oz of .999+ fine Silver. Single bars come in sealed plastic bags. ISO-certified and COMEX Silver good delivery. Obverse: Features RMC mintmark, an iron rod above the "M" as it pours liquid metal into the burning furnace for purification, along with the weight and purity. 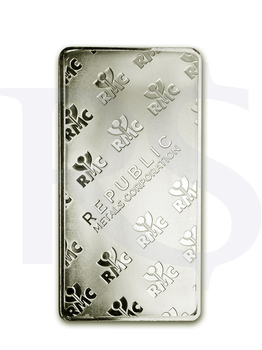 Reverse: RMC logo repeating diagonal pattern surrounding company name Republic Metals Corporation.